It might seem simple, but how you get from a verse to a chorus can be crucial. Drum fills are an integral part of a songs transition, so do not skimp! A good transition sets up the next section of the song, with the best transitions adding weight and power. Think of ‘In The Air Tonight’ by Phil Collins. What is the first thing that comes to mind? Is it the man in the Gorilla suit from the Cadbury’s advert? Maybe. Is it that enormous drum fill? Probably! Do you follow up that massive drum fill with your rendition of the chorus? Definitely. Fills add excitement so if you need to add some urgency and animation to your music, check out the fill packs explored below. Below is a short list of the drum fill samples we talk about in this article. Scroll down for more details or click for audio demos. 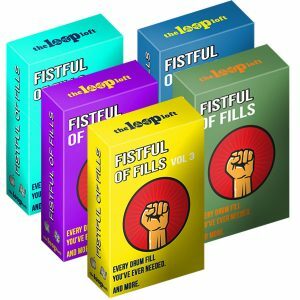 Fistful of Fills bundle from The Loop Loft combines five volumes of popular Fistful of Fills packages into one massive collection. 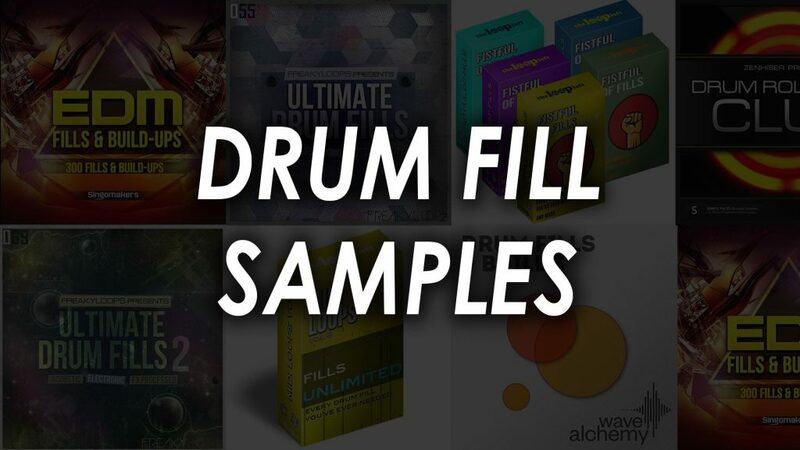 This bundle provides over 600 individual drum fills spanning all genres of music. Not only is the range of genres covered wide, the tempos range from 65 to 300 beats per minute! Recorded at 48 kHz / 24 bit, The Loop Loft continue providing high quality recorded samples to your Digital Audio Workstation. Each fill comes in WAV, REX2, Stylus RMX and AIFF formats, ensuring you can loop and edit each fill with ease. Whether it is Jazz crescendos, Funk snare flams or a thunderous assault of tom-toms, The Loop Loft has got you covered with over 1000 fills included in this bundle! If the sheer size of the bundle is not enough of a reason to like this pack; who does not like options? The size of the collection makes slotting fills into your track a breeze due to the span of genres, styles, and sounds on offer. Supplementing one of these fills at the end of a static loop can help lift your tracks. As always with The Loop Loft, these fills have groove. Injecting a little bit of human touch to your productions can help you stand out from the crowd. Perfect for singer-songwriters without access to session musicians. Ideal for electronic musicians looking to add intensity to their transitions with energetic drum fills. 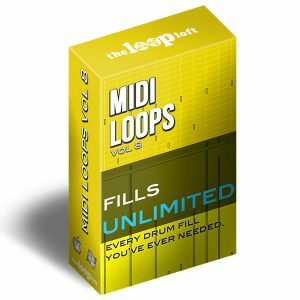 The Loops Loft’s Fills Unlimited is a collection of over 100 MIDI drum fills. These unique drum fills are organized into folders depending upon their musical length, as well as straight and swung feel. Fills can be very difficult to program by hand, but the The Loop Loft takes the heavy lifting out of the job with these realistic drum fills. There are many libraries available on the market today, but sifting through experimental and esoteric sounding fills can be frustrating. If straight to the point drum fills are what you crave, this is the package for you. MIDI! Oh, how we love MIDI. When dealing with audio, you may come across the perfect drum fill rhythm, but the sound may not cut the mustard. With MIDI you can trigger the drum fills using your Virtual Instrument of choice, allowing you to have full control over the sound of your drums. Found the perfect rhythmic fill for EDM? Trigger your favorite TR-808 emulation! Found a drum fill that would announce your Heavy Metal track to the listener? Trigger using your favorite real drum emulator. Despite being 35 years old, MIDI is still a very powerful tool for any producer. Being able to trigger any VI you desire with MIDI makes Fills Unlimited a great addition to any producer’s hard drive. 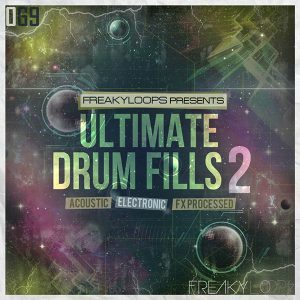 Ultimate Drum Fills from Freak Loops is a combination of groovy electronic fills, stunning live drums, complex drum fills and glitched electronics, making this collection perfect for use across Electronic Dance Music and its sub-genres. Each fill is loopable and synced to 128 beats per minute. Every sound in this pack has been processed using high-end outboard pre-amps, EQ, and compressors, as well as a host of extra processing in the box. This level of processing provides you with a pack of fills that can be used straight away. The sound! It can be quite difficult when working with Electronic Dance Music to find an appropriate fill to help level up the excitement in the track. The level of detail that has gone into these drum fill samples ensures that every sound is full of power and depth. Drop one of these fills into your DAW, balance the fader and leave it alone! Dancefloor ready! Another big love is the stylistic range of the fills. Whether it is a funky fill, a complex EDM build or something that slams into your breakdown, this pack has you covered. Ultimate Drum Fills is 115 individual drum fills, ideal for people working within Electronic genres. We loved Freaky Loops’ Ultimate Drum Fills. Ultimate Drum Fills 2 is more of the same! So, if you liked the examples you heard for the above pack, UDF2 brings the same high-quality processing and range of genres, with 115 new drum fills! 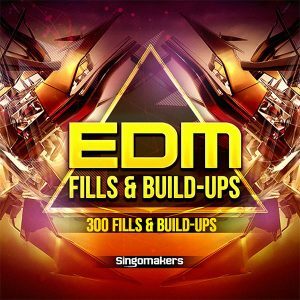 All the fills in this pack are synced to 128 beats per minute, like its predecessor, so if you are producing in the harder Electronic Genres, this may not be the pack for you. UDF was standout for its potential to completely transform a dull EDM track into a main room smash. What we love about these drum fill samples is that Freaky Loops have followed on with the same high-quality format, to bring more variation. Just like the Wilhelm Scream in film, people tend to latch onto samples in audio, and can soon sound unoriginal and boring. UDF2 builds on the fantastic foundation of the debut pack and brings a further 115 drum fills to help keep your productions moving and the dancefloor grooving. Check the demo tracks on the website to hear the variation for yourself! 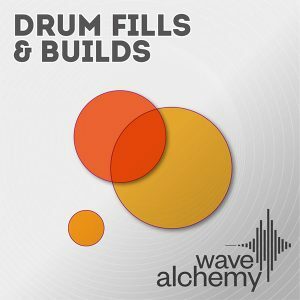 Wave Alchemy’s Drum Fills & Builds is a collection of versatile, well-crafted and inspirational builds and fills. This pack contains 173 audio files spread across three different tempo ranges; 70, 105 and 126 beats per minute, covering a wide range of styles. From crackling drum breaks, vinyl-infused grooves, layered fills, experimental fills, epic sounding percussive builds, morphed vocals and more, this pack is ideal for producers looking to expand their sonic pallet. Each audio file is formatted as WAV, REX2, and Apple Loops. This pack sounds unique and stands out from the crowd. When listening to the drum fills in this collection, sound design came to mind. You can feel the movement, suspense, and impact in each fill. Due to the level of processing involved in this pack, these drum fill samples are ideal for the producer looking to drag and drop a fill, with minimal tweaking. Another big love for this pack is the range of genres. As much as the manufacturer describes the pack as being ideal for Electronic Music producers (and we agree! ), it’s obvious that the slower samples would be ideal in Hip-Hop and Trap. The final big love is the REX2 compatibility. Combine REX2 with the range of tempos provides and you have the flexibility of being able to edit these fantastic sounds to suit any production you are working on. What makes the professional EDM producer stand out against the bedroom amateur? The intensity. Flick through your list of reference tracks and pay close attention to how sections transition. Fills and build-ups. A powerful fill or build before the drop can be everything your production needs to help it rub shoulders with your favorite tracks. 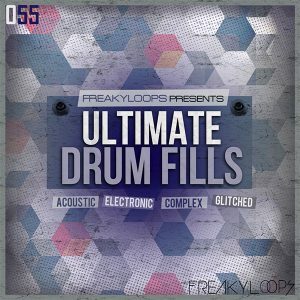 This collection contains 300 fills and build-ups and extra loops. Perfect for helping craft extra energy into your tracks. All audio files are recorded at 44.1 kHz / 24 bit and include 150 REX2 files for extra editing. Creating intense fills and build-ups for Electronic Dance Music can be difficult, but this pack takes the hard work out of it, allowing you to focus on the most critical part – the song! The variation of fills and builds available in this collection are the packs greatest strength. Whether you need a quick one bar fill for your EDM tinged pop track, a four-bar fill to keep the club on edge before your drop, or triplet fills for your Dubstep smash; this pack has you covered. Ideal for producers working across a range of EDM genres, with the REX2 compatibility allowing each fill and build to be sliced and sequences to your taste. 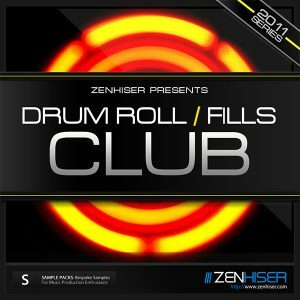 Drum Rolls and Fills by Zenhiser is a must have collection of percussive transitions for Dance Music producers and remixers. This pack contains 200 clubby drum rolls and fills, processed to drag and drop into your track at a club friendly 128 beats per minute. These intrinsic rolls and fills have been created from the ground up, delivering a whole new arsenal of sounds to your hard drive that you never knew you needed until now. From classic 808 sounding fills to analog breaks reminiscent of early Dance music to reversed, flanged rolls, this pack ticks a lot of boxes! Included in this pack are 200 drum roll and fill loops. Perfect for people working with House, Techno, Electro House and Progressive House. Zenhiser has built themselves quite the reputation for no-nonsense sample packs. Masterful processing has been carried out for each of the drum rolls and fills, allowing you to drag and drop the fill or roll you need straight into your production. Just listening to the preview on the website demonstrates the aural attack available with this pack. Dropping in a pre-filtered roll allows you to spend less time automating filter cut-off frequency and more time on crafting the perfect banger. What we find most enjoyable about the pack is the variety. From heavily glitched samples to phat analog snares. Whether you need a fill to cover a bar or four, Zenhiser provide the goods again with Drum Rolls and Fills. Well, that is a wrap! This article’s intention was to introduce you to some of what we believe to be the best drum fill sample packs on the market today. With that in mind, it puts producers of all experience levels and genres in good stead at finding the perfect pack for them. We’ve covered the bedroom producer who wants to add a drummers’ feel to a track with a live drum kit fill. We’ve covered the producer who is getting tired of using the same MIDI loops over and over again. We’ve covered a weight of samples available for those trying to build the intensity of their latest EDM smash before the drop. As always, make sure you visit the manufacturers’ website and listen to the audio examples. Listen for what the fills can add to your track, whether it is a simple drag and drop function or something you are going to have to tweak a little further to fit. Another important recommendation is to think about what you want to be creating. If you are looking at competing with people higher up the ladder in your genre, what are they currently doing that sets them apart? Find that missing ingredient in a drum fill pack above, and transition your way to the next step in your music career.